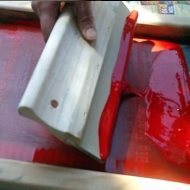 We at Matchless Print specializes in custom screen printing and heat transfers on a full range of sportswear, casual wear, corporate wear and safety wear.... From the basic t-shirt to top shelf polo shirts, to high performance athletic wear and busines wear. Everything is handled "in house". From graphic design, to pre-press samples and finaly production. NEED IT YESTERDAY? NEED ONE, 1000 OR MORE has been our tag line for years. 3 Day rush turnaround is possible at small or no extra charge, when production allows. Normal turnaround is usually 5–7 working days. The first requrements before we can start screen printing is a graphic art. Graphic art is computer generated design ready for filming. It can be the combination of clip art pictures and text. or just a simple scetch. We usually produce a number of different designs that we present to out customers. After design is picked we do colour separation and produce laser films needed for deveoping of the screens. Separate screen has to be developed for each colour of the design. Once we have artwork we then create a film positive by high resolution laser printer. Separate film is needed for each colour of the design. First we take a screen which has a very fine silk mesh fabric attached light sensitive emulsion. The screen is then placed in a dark cabinet for 1/2 an hour so that the emulsion can dry. When the emulsion is dry we take our positive and place it on the screen and expose it to imtensive light. Once the screen has been exposed for the proper amount of time it is removed from the light unit and is then washed so that the soft emulsion can be removed exposing the mesh holes. After drying screen is ready to be mounted up on the press. 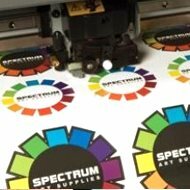 If the design is in multile colors we set each screen on the print stations and register each one so that each color of the design lines up properly. If the test print is satisfactory we are ready to run the job. If our press set-up, screens and artwork is good the printing is the easy part. Each garment is placed on one of the stations of the rotary press and each color of the design is printed. 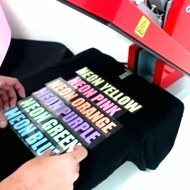 After all of the colors are printed the garment is places on a conveyor dryer so that the ink can be cured.